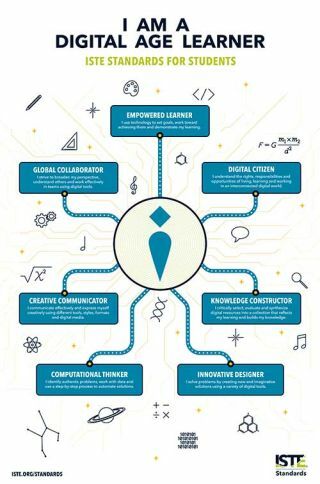 The ISTE Standards for Students names practices in which many innovative educators are already engaged. It gives a standard language for educators to speak to each other about their work. It also provides language and justification for doing this work when speaking with administrators. When implementing standards with students, it is also important to introduce them and their parents to the standards which you are working towards.To help with that, ISTE teamed up with Flocabulary to create this video. The poster below illustrates the seven standards highlighted in the video. Have student digital portfolios set up by the standards. Have classroom bulletin boards that represent each standard. On the bulletin board, provide sample student projects that come to life with QR codes. Let students know what standards they are addressing in their work. Showcase student work organized by standard on your teacher website.